Vice President Mike Pence addresses the Atlantic Council's "NATO Engages the Alliance at 70" conference, in Washington, April 3, 2019. 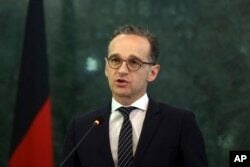 German Foreign Minister Heiko Maas, speaks during a press conference with Afghanistan's Foreign Minister Salahuddin Rabbani, in Kabul, Afghanistan, March 11, 2019. 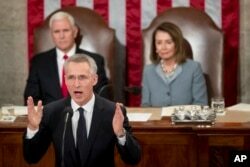 NATO Secretary General Jens Stoltenberg, accompanied by Vice President Mike Pence, left and House Speaker Nancy Pelosi of Calif., right, addresses Congress on Capitol Hill in Washington, April 3, 2019. 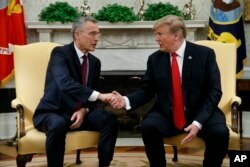 President Donald Trump shakes hands with with NATO Secretary General Jens Stoltenberg during a meeting in the Oval Office of the White House, April 2, 2019 in Washington.